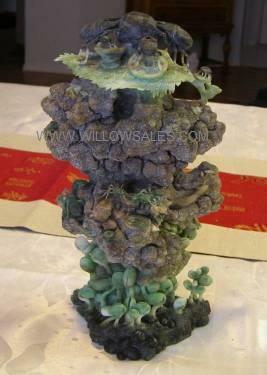 Jade Sculpture Carvings Available October 2012 Direct from the Jade sculpture carvers in the orient. Available NOW! Look for the NEXT PAGE links to see more. These fine sculpture carvings on the next few pages must be shipped from China. 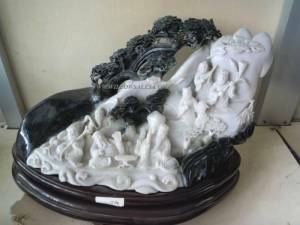 These carvings rarely get out of China. the best do not last long. Let us know if something is of interest. We have original photos. We are based in the USA. Jade Carving Art Custom Order Items from October 2012. 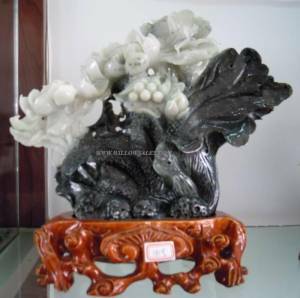 Jade sculpture is made of 100% real Dushan Jade. Wonderful for your home or Office. This also has a base made from a nice hardwood. SIZE 32x20x8cm. (30cm - 12" inches. approx 13 inch). Shipping: The ONLY safe way to ship these fine valuable works of art is by sea. Air is just not safe. As these are stone they are heavy and expensive to ship by air anyway. 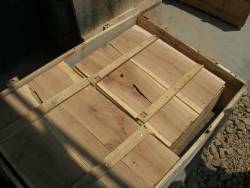 We build a large wood crate for even smaller items like these and place it securly in the center. If they can't pick it up, they can't throw it !! and this system has worked well for many years. SIZE 26x22x8cm (30cm - 12" inches. approx 10 inch). 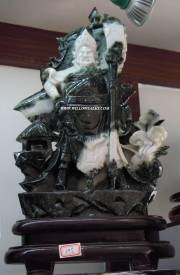 Some history on Dushan Mountain jade from wikipedia.org Search for "Jade". "As early as 6000 B.C. Dushan Jade has been mined. In the Yin Ruins of Shang Dynasty (1,600 B.C. to 1,050 B.C.) 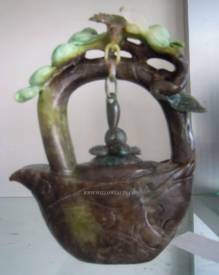 in Anyang, Dushan Jade ornaments was unearthed in the tomb of the Shang kings. 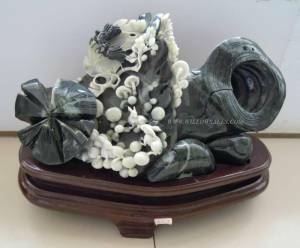 Jade was used to create many utilitarian and ceremonial objects, ranging from indoor decorative items to jade burial suits. 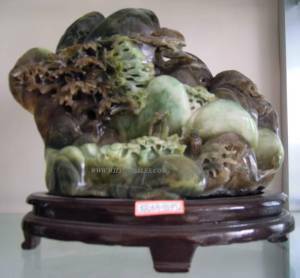 Jade was considered the "imperial gem". 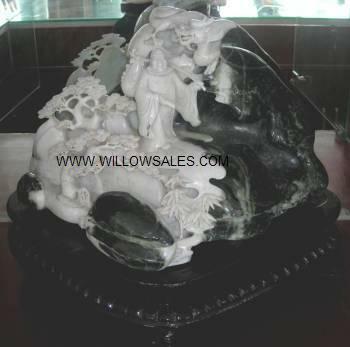 Jade sculpture is made of 1 solid stone. 100% real Dushan Mtn. Jade. Approx 40 lbs of Dushan Mtn jade! Size: W45 D28 H33 cm. 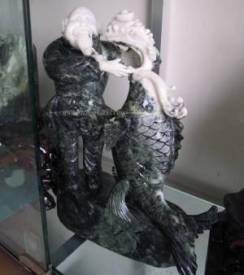 Jade sculpture is made of 100% real natural Dushan Mtn Jade. 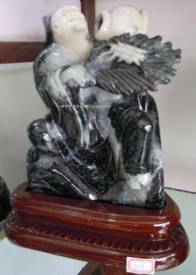 One of the most amazing works of chinese art sculpture we have seen. See More information and larger images Click here. SIZE 22x20x6cm (30cm - 12" inches. approx 9 inch). SIZE 15x18x12cm (30cm - 12" inches. approx 7 inch). 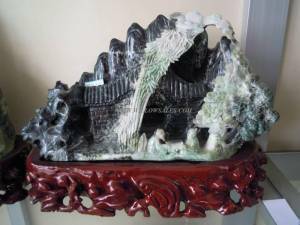 As of March 2007 that the China government has closed Dushan Mountain to mining jade. except for 1 single government operated company for special occasions. 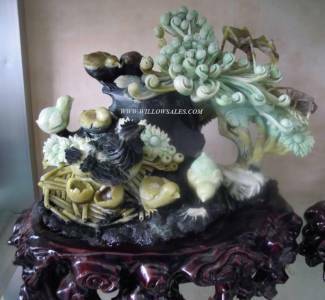 All of the hundreds of carvers in the area will not be able to get more Dushan Jade. 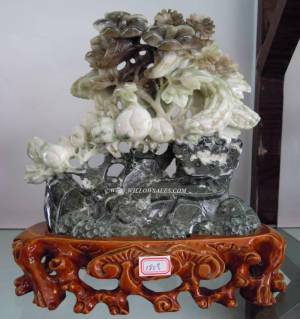 Be ready for prices to skyrocket on this Dushan Mountain jade as it is nearly gone and they have as of 10/2012. SIZE 50x30x19cm (30cm - 12" inches. approx 20 inch). SIZE 38x20x12cm (30cm - 12" inches. approx 15 inch). SIZE 35x23x20cm (30cm - 12" inches. approx 14 inch). SIZE 26x18x15cm (30cm - 12" inches. approx 10 inch). SIZE 18 x 43 x 20cm (30cm - 12" inches. approx 18 inch). SIZE 25 x 32 x 10cm (30cm - 12" inches. approx 13 inch). SIZE 9 x 19 x 8cm (30cm - 12" inches. approx 7.5 inch). SIZE 17 x 21 x 6cm (30cm - 12" inches. approx 8.75 inch). SIZE 16 x 20 x 8cm (30cm - 12" inches. approx 8 inch). SHIPPING VIA LCL Shared Container Ocean Freight with a 1 cubic meter minimum fee. We utilize this 1 CBM by building a custom strong large wood crate even for a single carving for shipping. Our carpenter also makes wood boxes for the carvings as well so they are double boxed inside the large wood crate for safety. Air is not safe. They break everything. This is the only safe way, and it works. If they can't pick it up by hand they cant break it! 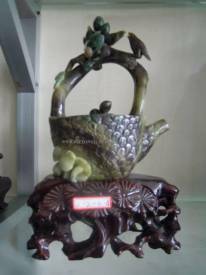 As we get these direct from the carvers in a remote village in China at local Chinese prices even with the shipping added it is still a great value. We see these selling for 10 times these prices in shops in Beijing and Shanghai. This shipping is not as difficult as it sounds. 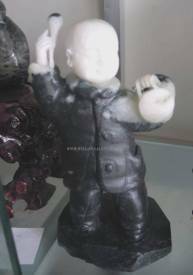 We have an excellent shipping agent to help us in Tianjin, and we can help arrange a broker for you to clear customs at it's destination and they do everything. Air is nearly as much anyway as they are heavy and they will not insure them. The best insurance is good packing ! As these are one of a kind works of art it is worth the little effort to make sure they arrive in one piece. you can use PayPal to accept bank cards. CAUTION !! BEFORE PURCHASE PLEASE CONTACT US FIRST TO GET YOUR FULL QUOTE !! We own several website names to help be found. Now there are so many bogus sites being placed on the internet we hope this will help us be found as we are a legitimate business and pay taxes and local fees. It is getting so bad now, we are finding others using our photos without permission in china. After we spent thousands of $ flying from the usa there over the years to accquire these fine pieces of art for our clients it is sad they have no respect for our hard work. We are located in the USA. We have been working in this business since 1999, and this stone since 2003. We travel all over asia and the orient to find these fine works of art direct from the actual carvers. We see net cafes full of students over there making websites and placing them on the net as well as alibaba flooding the searches. Beleive me, our stone carvers are hard working artists and have no idea how to read or write english, not to mention making websites in these remote villages. SO BUYER BEWARE !! sending money to untrusted fake sales websites you can loose your shirt. Our registered business name is Artfiberglass. We had seperate business names for our website names before but this is easier and cheaper at tax time to keep them all under one business name.